A panoramic Hill Country view and a southern exposure are the primary forces that shaped this design. 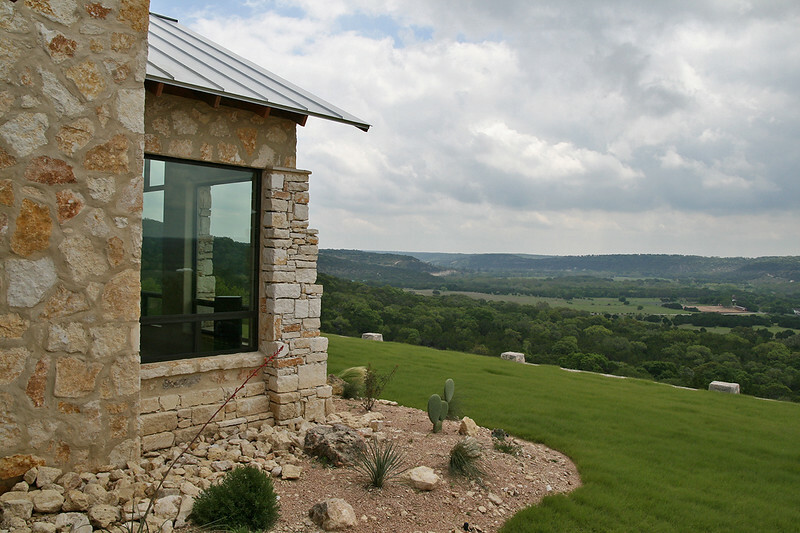 Perched on a small hillside plateau, the three components - Main House, Master Retreat, and Guest House - are gently rotated to frame differing views of the Blanco River Valley. The Main House is one open space comprises of the Kitchen, Living and Dining. The Master Retreat is positioned away from the Main House by a covered porch, but is still connected through the Master Bath. The Guest House is separated from the Main House by the Dog Trot - a breezeway that functions as the primary outdoor living area. Deep overhangs block the harsh summer sun. Expansive southern windows provide passive solar heating in the winter months. Strategically placed operable openings allow for natural ventilation throughout the year. A wide variety of natural materials are utilized, including drystacked boulders, smeared flagstone, reclaimed barnwood and long leaf pine, and stucco.